A studio portrait of Lt. Moses, in uniform while with the 114th “Brock’s Rangers” (Haldimand) Battalion. On this day in 1918, Lieutenant James David Moses is killed in action while serving with the Royal Air Force. Moses, of the Delaware band, from the Six Nations of the Grand River Territory, was born on 10 June 1891. 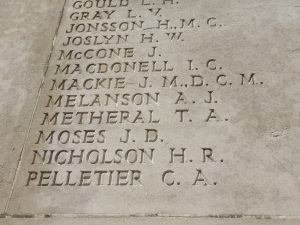 A school teacher before enlisting, Moses first served as an officer with the 114th “Brock’s Rangers” (Haldimand) and 107th “Timber Wolf” (Winnipeg) Battalions, and later as an air gunner and forward artillery observer with 57 Squadron, Royal Flying Corps. 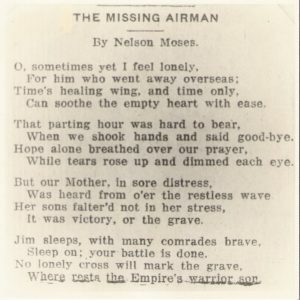 On 1 April 1918, he was reported missing and later confirmed killed. 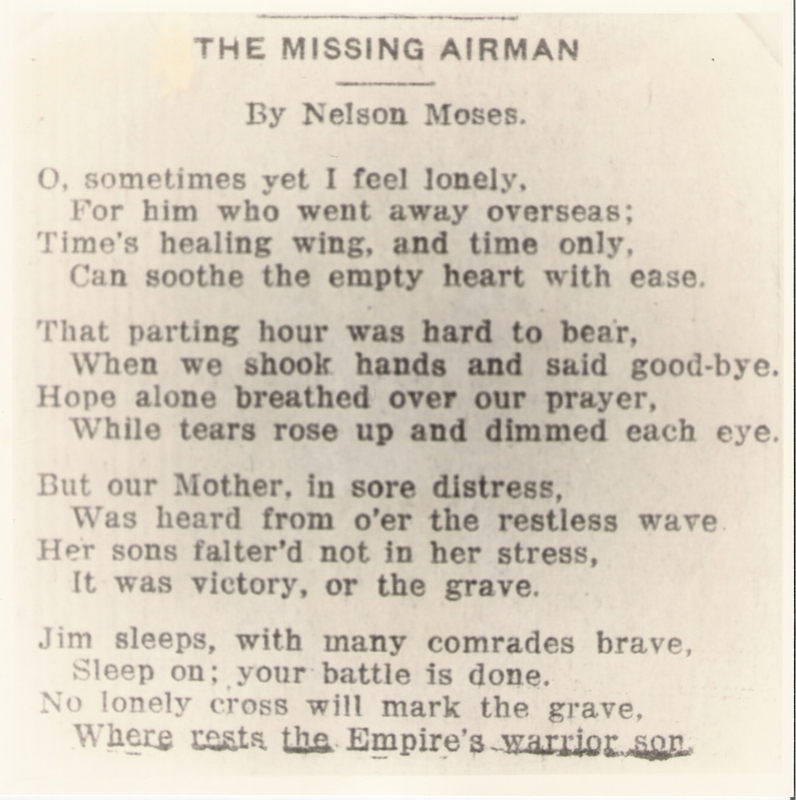 Sadly, Lt. Moses’ body was never recovered; he is listed on the Arras Flying Services Memorial. 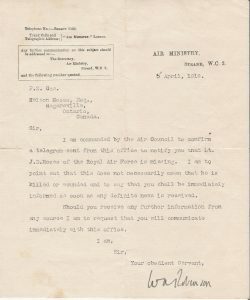 Fatefully, 1 April 1918 was also the official “birth date” of the newly formed Royal Air Force (RAF), and so, it appears, one of the first casualties of the famed RAF was in fact, an Indigenous person from Canada. Lieutenant James David Moses was just 26 years old. 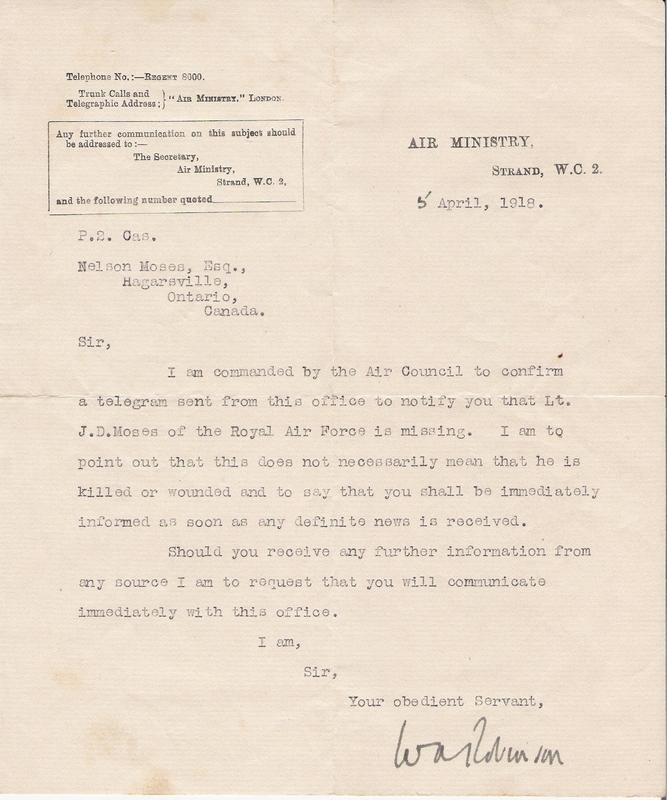 The “missing-in-action” telegram, received by Lt. Moses’ father on 5 April 1918. 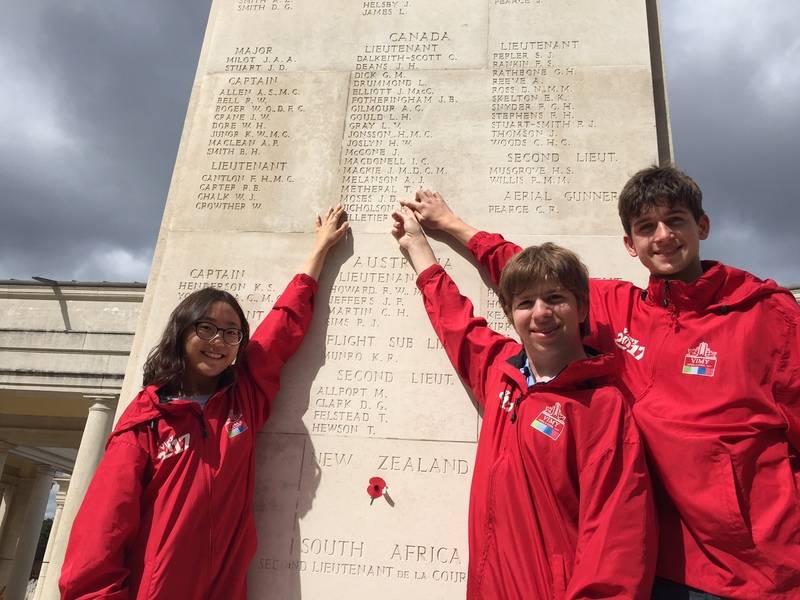 In 2017, our Beaverbrook Vimy Prize group was able to visit the Arras Flying Services Memorial and honour Lt. Moses. Credit: Katy Whitfield, The Vimy Foundation 2017. Arras Flying Services Memorial, France. 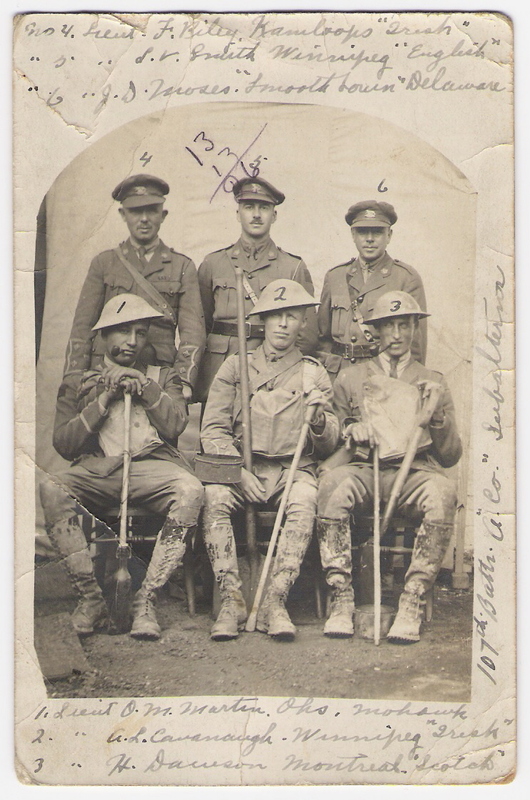 Lt. Moses (6) and fellow officers of the 107th “Timber Wolf” (Winnipeg) Battalion, including future-Brigadier and Magistrate, Oliver Milton Martin (1). 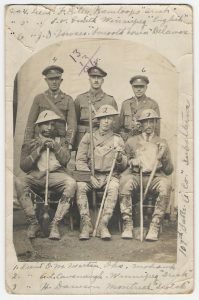 The 107th Battalion was one of Canada’s two largely Indigenous formations of the war. 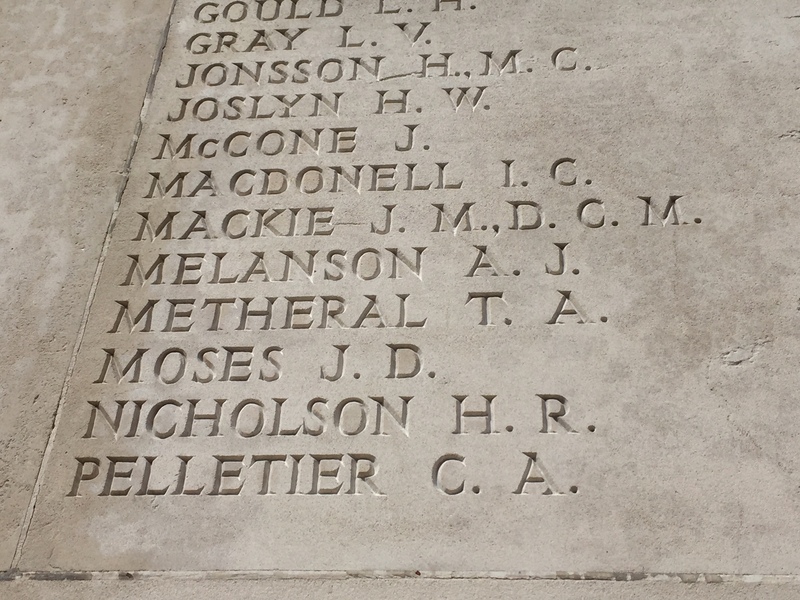 The other was the 114th Battalion into which both Martin and Moses had originally enlisted. “Charge of Flowerdew’s Squadron” by Sir Alfred James Munnings. On 21 March 1918, General Ludendorff launched Germany’s massive Spring Offensive, Kaiserslacht (Kaiser’s Battle) along the Western Front. The first phase, Operation Michael, involved thousands of troops, artillery, and poison gas, and the Germans quickly advanced deep into the British lines, causing catastrophic losses in both men and ground to the Allies. The Canadian Corps was in the First Army area and not directly affected by Operation Michael, however the Canadian Cavalry Brigade and the Canadian Motor Machine Gun Brigade were both brought in to shore up the British lines around Saint-Quentin. On 30 March 1918, the 23rd Saxon Division occupied Moreuil Wood, a vantage point near the critical Amiens-Paris railway and only twelve miles south-east of Amiens. Just south of the Wood, the French were under heavy attack in the town of Moreuil itself. When Moreuil Wood fell, the Canadian Cavalry Brigade, under Brigadier-General John Seely, was immediately ordered to re-capture the lost ground. As one, the Canadian Cavalry Brigade set off at a gallop, surging down from the village of Castel to the Avre River, charging across the bridge and up toward Moreuil Wood. The spectacle was not lost on the Brigade’s commander, who later wrote “it looked like a great host sweeping forward over the open country… it was strange to see the horses roll over like rabbits, and the men, when unwounded, jump up and run forward, sometimes catching the stirrups of their still mounted comrades” (Seely, Adventure, p. 302). Charging at the entrenched enemy over open fields, the leading Royal Canadian Dragoons suffered heavily under machine gun fire; seeking cover, many dismounted and entered into the woods wherever they could. The fighting within was heavy and hampered by “close-growing saplings and heavy undergrowth” (Nicholson, Canadian Expeditionary Force, 1914-1919, p. 369). But by 10 am, the enemy was slowly being pushed back. Still mounted, Lt. Gordon Flowerdew’s “C” squadron, Lord Strathcona’s Horse, had waited outside of the Wood for the opportunity to advance to the eastern flank. Reaching the north-east corner, Flowerdew spotted two lines of Germans, each numbering about sixty men, with machine guns at their centres and their flanks, advancing to reinforce the Wood. Immediately, Flowerdew “wheeled his four troops into line, and with a wild shout, a hundred yards in front of his men, charged down on the long thin column of Germans” (Seely, Adventure, p. 303). Their sabres drawn, Flowerdew’s squadron burst through both lines of the enemy, wheeled about, and then charged on them again, with decimating effect. After the second charge, the enemy broke into retreat. At some point in this desperate melee, Lt. Flowerdew was fatally wounded. Brigadier-General Seely later recorded: ‘A man with him told me his last words as he and his horse finally crashed to the ground – he had two bullet wounds through his chest and was shot through both thighs, but he still had strength to shout quite loudly, “Carry on boys. We have won.” And so they had.’ (Seely, Adventure, p. 304). Credit: Canada. Dept. of National Defence- W.W.I. collection/Library and Archives Canada/PA-006810. The survivors of Flowerdew’s squadron established themselves in a ditch bordering the Wood’s eastern flank, armed with the enemy’s abandoned machine guns. They held this position until reached by the other Canadians fighting through the Wood. The aftermath of Flowerdew’s charge was devastating. Only 51 members of “C” squadron were left alive, a casualty rate of approximately seventy percent. Of the enemy, 70 were counted killed by the sword during the charge, and an additional 200-300 were cut down by their own abandoned machine guns, commandeered by the surviving Strathcona’s (Seely, Adventure, p. 304). Altogether, the Canadian Cavalry Brigade suffered 305 men killed, wounded, or missing, and over 800 horses killed on 30 March 1918. Moreuil Wood and the smaller Rifle Wood would be lost by the British the next day. 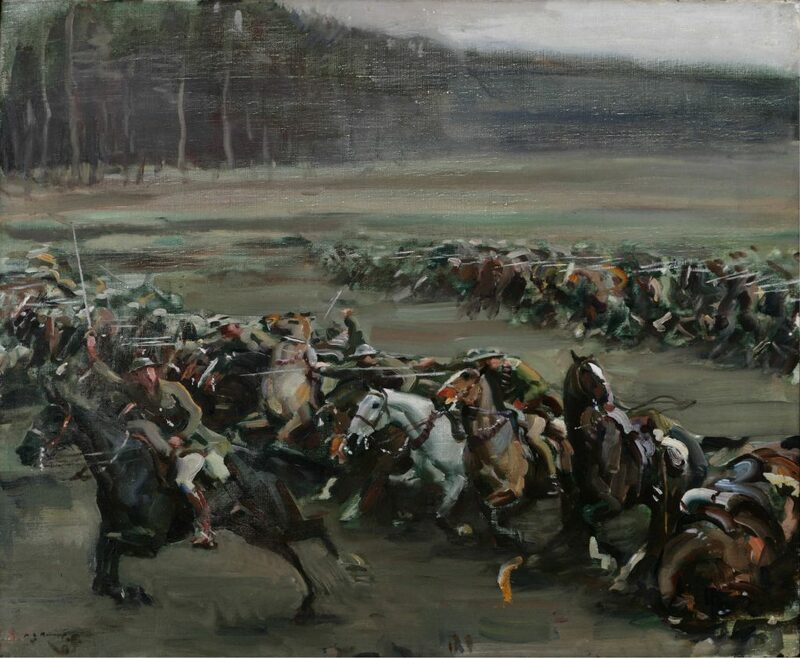 Counter-attacks waged back and forth over the contested ground until the Canadian Cavalry Brigade sent its’ remaining 488 men into the fray once again, re-taking Rifle Wood on 1 April. Moreuil Wood however remained in German hands until August 1918. 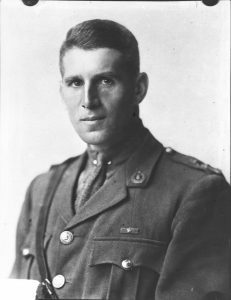 The leader of what is believed to be the last cavalry charge of the war, Lt. Gordon Flowerdew died of his wounds on 1 April 1918. He would receive a posthumous Victoria Cross. Fellow Strathcona, Lt. Frederick Harvey, VC received the Military Cross for his actions during the battle. After the war, war-artist Sir Alfred James Munnings immortalized Flowerdew’s actions in the now famous painting “The Charge of Flowerdew’s Squadron”. -Canadian Cavalry units, like their British counter parts, fought both mounted and dismounted. Terrain and the use of machine guns had made traditional cavalry charges suicidal at best, so they were very rarely used. Flowerdew’s charge was an exception. Lt Gordon Muriel Flowerdew, VC emigrated to Canada from England and settled in British Columbia as a rancher. He enlisted in 1914 with Lord Strathcona’s Horse and moved up the ranks to become an officer in 1916. Flowerdew’s Victoria Cross was donated by his mother to Framlingham College, where he was educated, after the war. 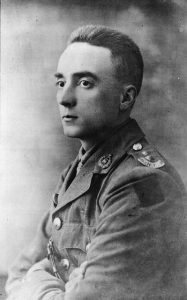 Lt Frederick Harvey, VC, MC received the Victoria Cross during a cavalry action at Guyencourt in March 1917, when he charged and eliminated a German machine gun post defending the village. He received the Military Cross for his actions during the Battle of Moreuil Wood. Harvey survived the war and returned to Alberta where he died in 1980, aged 91. The official Victoria Cross citation for Lieutenant Gordon Muriel Flowerdew. Credit: The London Gazette. 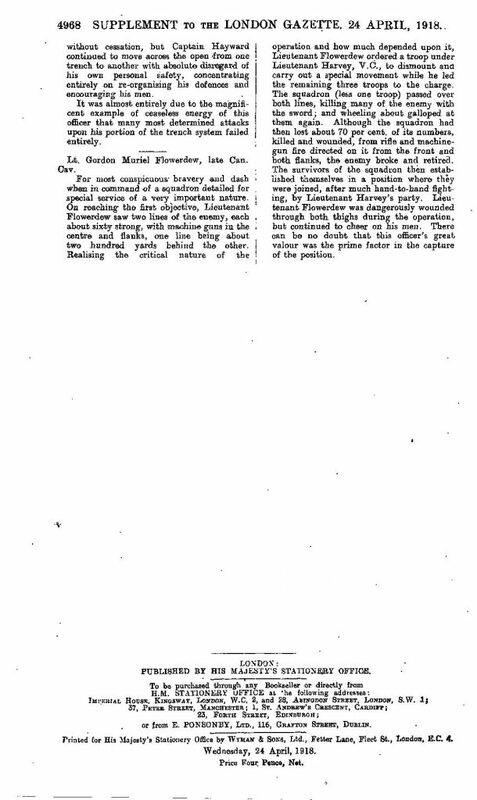 Publication date: 23 April 1918, Supplement: 30648, Page: 4968. An R.E.8 biplane of No. 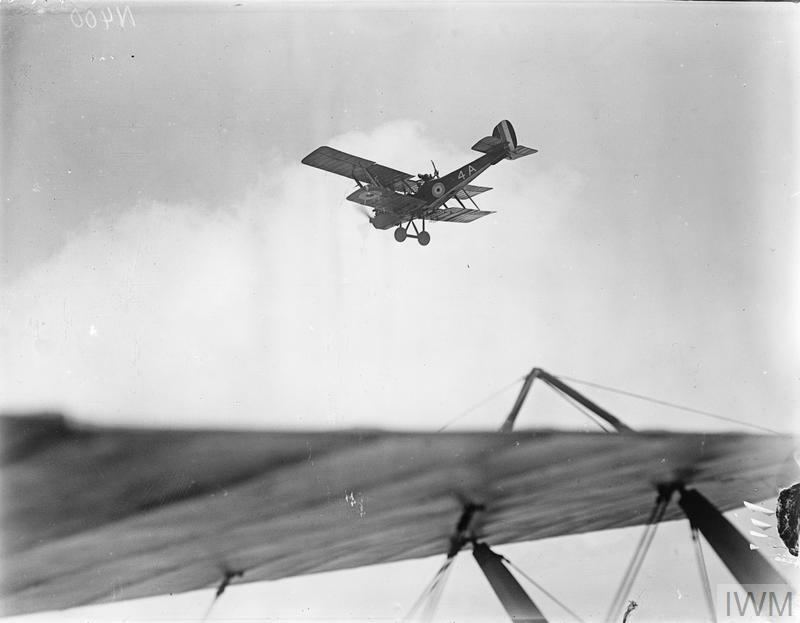 59 Squadron in flight on 15 May 1918. With Allied ground forces reeling from Operation Michael, many of the air squadrons were ordered to provide urgently needed ground support. Now that the enemy was moving out in the open, low-level strafing and bombing became the order of the day, as the Allies desperately tried to slow the enemy’s advance (Wise, Canadian Airmen and the First World War, p. 492-493). “52 Squadron’s Lieutenant T.E. Logan of New Glasgow, NS, flew his RE8 over Contescourt… finding the village plugged with German transport. He dropped eight bombs from 350 feet ‘with excellent effect’ and returned westwards along the Contescourt-St Simon road, flying at a hundred feet and finding it, too, ‘blocked with transport and infantry’ moving forward. His observer had pumped some 250 rounds into them before Logan was wounded three times by ground fire, but despite his wounds he succeeded in landing behind the British front.” (Wise, Canadian Airmen and the First World War, p. 496). 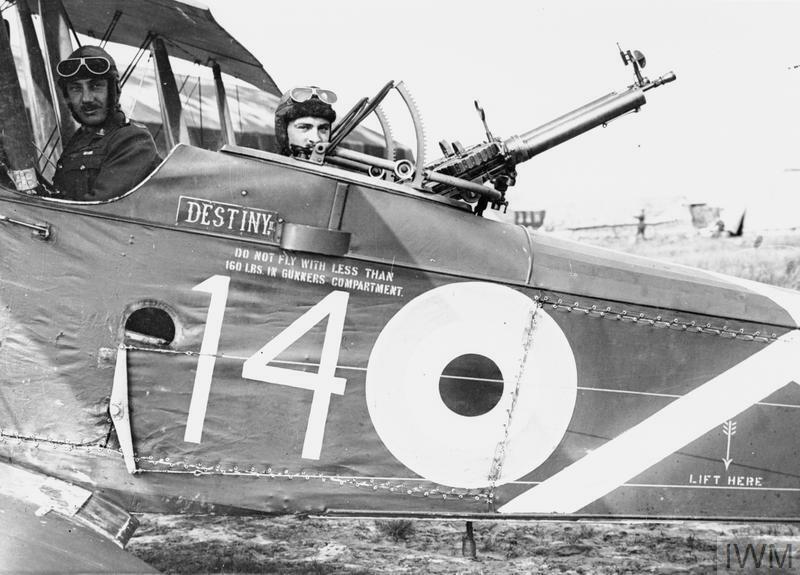 The pilot and gunner of “Destiny II”, an R.E.8 biplane of No. 52 Squadron, RFC, prepare to take off. Even finding a safe place to land could be an issue. As the German offensive rolled on, Allied aerodromes quickly found themselves uncomfortably close to the front. 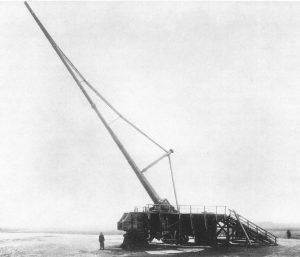 On 21 March 1918, the very first day of Operation Michael, No. 5 (Naval) Squadron had to evacuate its aerodrome at Mons-en-Chousée, taking off in their machines as enemy shells struck the airfield itself (Collishaw, Dodds, The Black Flight, p. 159-160). Some squadrons, grounded by weather, were even forced to burn their machines in massive bonfires, before retreating from the airfields overland (Wise, Canadian Airmen and the First World War, p. 511). *Editor’s Note – Sadly, Lieutenant Thomas Edgar Logan of New Glasgow, Nova Scotia would not survive the war. During his recovery from the wounds suffered during the ground attack quoted above, Lt. Logan was tagged as an invalid and received recommendation for three months’ leave in Canada. While it is unknown what happened during the months in-between, on 22 November 1918, he was killed in an aeroplane accident while in Canada. Buried in New Glasgow (Riverside) Cemetery, Nova Scotia, Thomas Edgar Logan was only 24 years old. 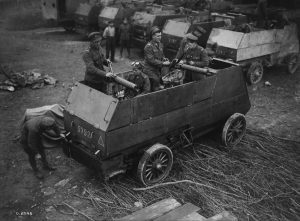 On this day in 1918, in support of Operation Michael, the massive “Pariskanone” (Paris Gun) fires on the French capital for the first time. Weighing over 600 tons and with a barrel measuring approximately 36 metres long, it could fire a 230-pound shell approximately 130 kilometres. The first shells that struck Paris were fired from approximately 120 kilometres away – a range so great that the Coriolis Effect (the rotation of the Earth) had to be factored into aiming the weapon. On 21 March 1918, General Ludendorff launched Germany’s massive Spring Offensive, “Kaiserschlacht” (Kaiser’s Battle), along the Western Front. 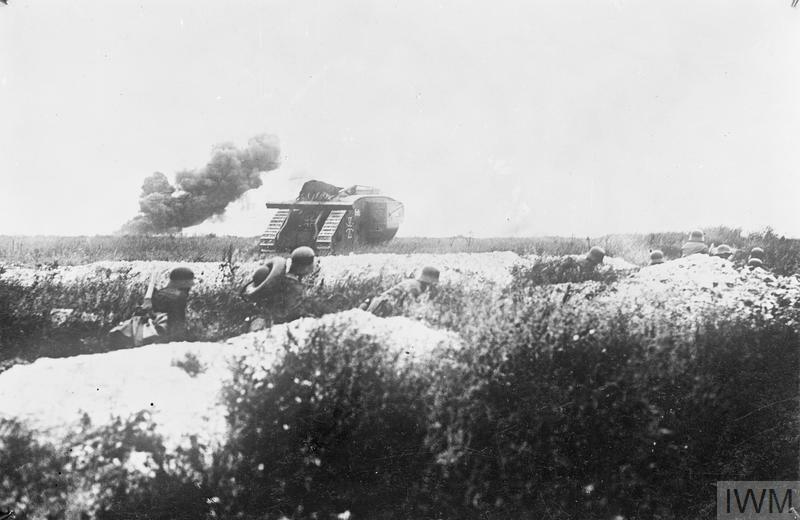 The first phase, Operation Michael, involved thousands of troops, artillery, and poison gas, and the Germans quickly advanced deep into the British lines, causing catastrophic losses in both men and ground to the Allies. 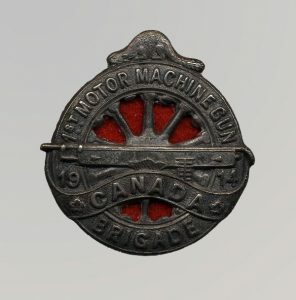 While the Canadian Corps was not directly affected by Operation Michael, the Canadian Cavalry Brigade and the Canadian Motor Machine Gun Brigade would soon be pulled into the chaotic fighting around Saint-Quentin. Read on below and follow the links to discover Canada’s involvement in Operation Michael. 23 March 1918 – The Canadian Cavalry Brigade – On 23 March 1918, a mounted force of 500 Canadian and British cavalrymen was urgently improvised to counter-attack the advanced enemy positions and regain broken infantry lines on the third day of Operation Michael (Nicholson, Canadian Expeditionary Force – 1914 – 1919, p. 369). A force of 800 Canadian cavalrymen had already been dismounted to cover the retreat of British forces since the second day of the German offensive. With the British lines now slightly stabilized, a re-mounted force was needed to provide fast-moving, mobile reinforcements (Nicholson, Canadian Expeditionary Force – 1914 – 1919, p. 369). Credit: Canada. Dept. of National Defence/Library and Archives Canada/PA-006658. 27 March 1918 – Lord Strathcona’s Horse – On 27 March 1918, French troops made a series of small counter-attacks into the German offensive, re-establishing contact with British troops on their flank. While advancing on the village of Fontaine, they captured a handful of “prisoners dressed like Canadians” (Nicholson, Canadian Expeditionary Force – 1914 – 1919, p. 369). In fact, these “prisoners” turned out to be men of Lord Strathcona’s Horse. 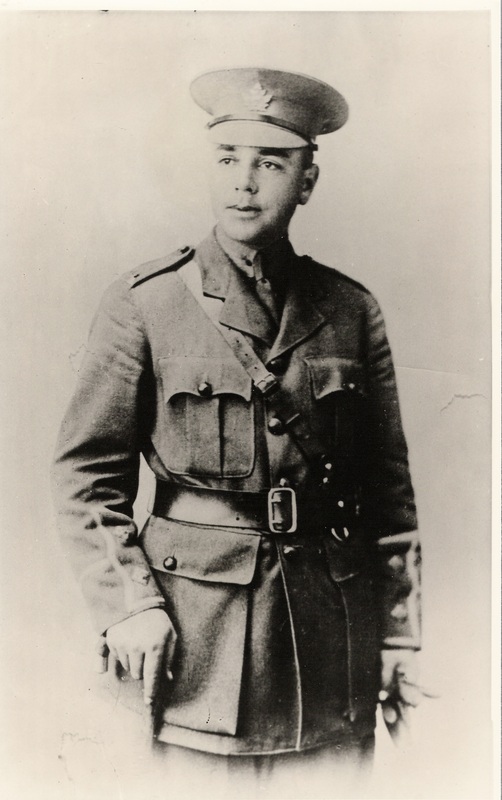 Led by Victoria Cross-recipient Lieutenant Frederick Maurice Watson Harvey, the eleven cavalrymen had been conducting a mounted reconnaissance when they cleared Fontaine of “a greatly superior force of Germans” (Nicholson, Canadian Expeditionary Force – 1914 – 1919, p. 369). Credit: Canada. Dept. of National Defence/Library and Archives Canada/PA-167307. #OnThisDay in 1918, the final plans for the Zeebrugge and Ostend Raids were submitted for approval. 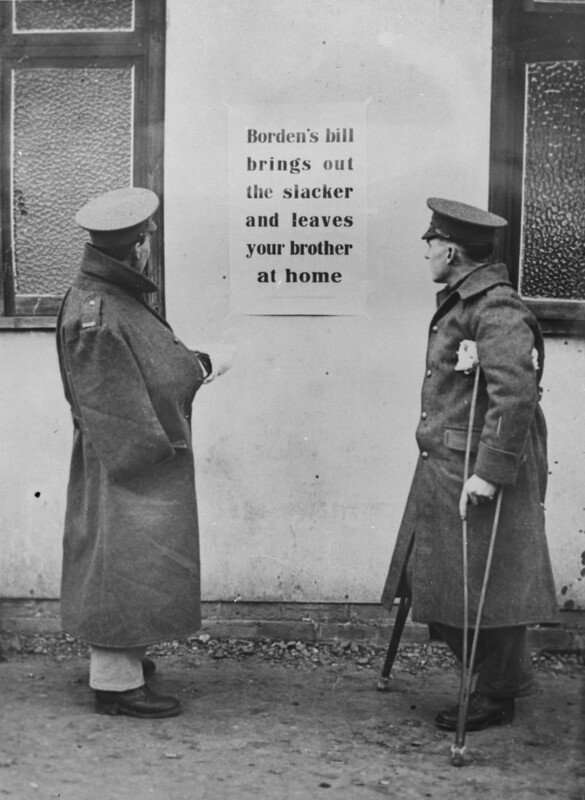 Britain had continued to suffer shipping losses from enemy submariens and, with the Commonwealth armies recovering from the battles of 1917, it was clear that Germany’s “Flanders Flotilla” harboured in Bruges could not be dealt with overland. 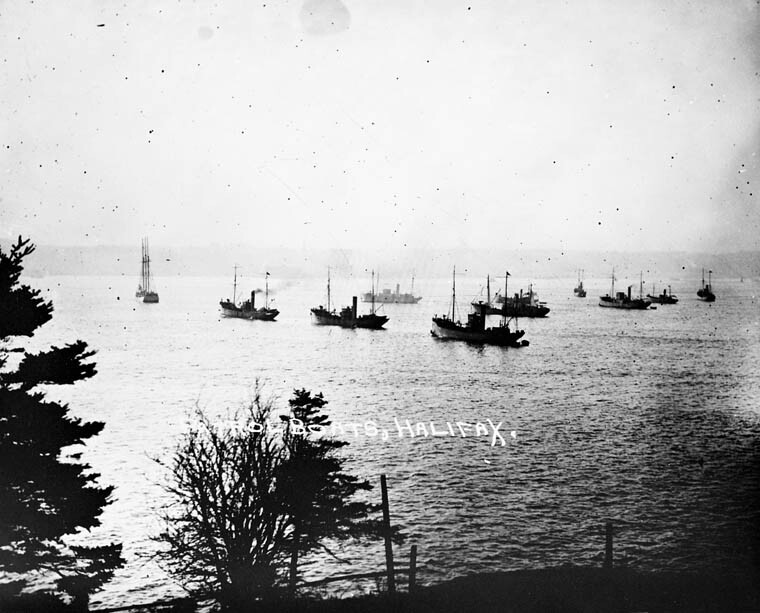 The losses were felt even in Canada, where the Royal Canadian Navy was left scheming how to defend its shipping lanes “with only slow, inadequately-armed auxiliary vessels, trawlers and drifters” (Gimblett, The Naval Service of Canada, 1910-2010: The Centennial Story, p. 35). If something drastic was to be done about the Flanders Flotilla, it would fall to the Royal Navy and Royal Marines. Epitaph of Lieutenant Phillip Comfort Starr, Royal Engineers, 20 February 1918. Phillip was born in Chicago, Illinois and attended Harvard College from 1910-1912, before leaving to work as a mechanical engineer. In 1916 he crossed into Canada and enlisted with the Canadian Field Arillery (CFA). He later attended courses with the University of Toronto’s Training Company and was subsequently discharged from the CFA in order to obtain a commission in the British forces. Eventually joining the Royal Engineers, he was killed on 20 February 1918 while taking part in night reconnaissance at Ypres. 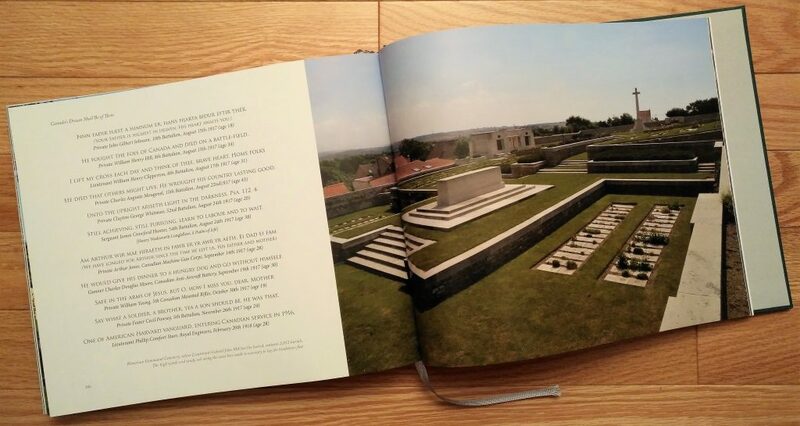 Lt. Phillip Comfort Starr is buried in Bedford House Cemetery, West-Vlaanderen, Belgium.